A 2-liter bottle makes a convenient water storage container that easily fits on pantry shelves or under beds. Fill it with warm soapy water, shake it up, then rinse it thoroughly. Next, fill it with drinking water and add about 4 drops of unscented bleach. Wait thirty minutes then smell the water. If there isn’t at least a hint of chlorine, repeat the process. Also remember that plastic breathes so don’t store these bottles next to gasoline, household cleaners, or any other liquid you wouldn’t want in your water. Finally, put the date on the side with a marker or label and replace them 6 months to a year later. In addition to a 2-liter bottle, you’ll also need sand, charcoal, grass, and rocks (small, medium, and large) to make a water filter. This article has step by step instructions. She uses a juice bottle, but the principle is the same. Fill your 2-liters with water, then place them on a hard surface in direct sunlight for an entire day (two days if it’s cloudy). The UV rays will kill any microorganisms in the water, making it safe to drink. However, the bottles must be made of clear plastic, the water must be fairly clear, and you need to be no more than 35 degrees above or below the equator. So if you live in the United States, this only works in the south. Here’s some more information. A 2-liter bottle could be a convenient way to gather wild edibles such as herbs and berries. When you have enough, you can put the cap back on and ensure the edibles stay dry on your way back to camp. To do this, simply cut off the top of the bottle where the curved part begins and you have yourself a funnel. This could be useful for filling other bottles with food or water. Instead of cutting the bottle straight across, cut it at an angle just below the curved part. Leave the cap on, and you’ll have a scoop you can use for food, water, dirt, or whatever else you need to scoop. First, you’ll need to wash them out thoroughly and make sure they’re 100% dry. Setting them upright with the cap off in direct sunlight for a while should do it. When they’re ready, use your funnel to pour food into the bottle. When it’s almost full, top it off with a 300cc oxygen absorber and screw the cap on really tight. And as with storing water, make sure you don’t store your food next to anything toxic. If your freezer isn’t completely full, you should fill some plastic bottles with water and use them to fill in the empty spaces. Just leave a few inches at the top of the bottle so the water has room to expand as it freezes. By doing this, you’ll make your freezer food take a lot longer to thaw if the power goes out. You could also grab a few of these ice bottles and use them in a cooler. And when the ice melts, you can open the bottle and drink it (if you plan on doing this, make sure the bottle is clean before you fill it). For this, just cut off the bottom of the bottle. Where exactly you cut it depends on how deep you want the bowl to be. Since the plastic is thin, I wouldn’t recommend using it for hot soup. Now that you have a bowl, you probably need a spoon. 2-liter bottles have five bumps on the bottom. What you can do is get a bottle and cut out the shape of a spoon, using one of those bumps as the bowl of the spoon, like so. Cut the tops off of two bottles, use a file to smooth down the saw marks, and super glue them together with the caps facing outward. Now you have a tiny capsule that can hold pills, seeds, jewels, and other small valuables. Here are some instructions. 2 liter bottles are perfect for getting seeds started. Cut the bottle in half, poke some drainage holes in the bottom, add some potting soil and water, then plant your seeds. To help the seeds germinate, you can place the top half over the bottom to create a greenhouse effect. This video explains it all. There are several ways you can use 2-liter bottles for plants, but one of the most interesting is the self-watering pot. You cut the bottle in half, put some water in the bottom, turn the top upside down and fill it with soil, and place it in the bottom part. Then, several pieces of strings going through the cap act as wicks, drawing water from the basin into the soil. Confused? Here are step by step instructions with pictures. You can also use 2-liter bottles to make a drip irrigation system. Cut off the bottom of the bottle and discard it, poke some holes in the cap, then turn the top of the bottle upside down and half-bury it next to your plants. Fill it with water and refill as needed. Here are some more details. Here’s an idea that’s great for plants like tomatoes and peppers. You cut the bottle in half, turn it upside down, fill it with soil, and hang it up. The plant grows out the bottom where the cap was. Of course, it’s a little more complicated than that. If you’re interest in trying this, here’s the tutorial. There are several ways to do this as well. If you just want to catch those annoying flies, all you need to do is fill your bottle halfway with water, drop a piece of raw meat in there, and poke a few holes near the top. The flies will crawl in after the meat and get trapped. Eventually they will drown in the water. For other mosquitoes, you’ll need a different kind of bait and a slightly more complicated trap. Here’s how to make one. Try jam dissolved in water for wasps, and orange juice for fruit flies. 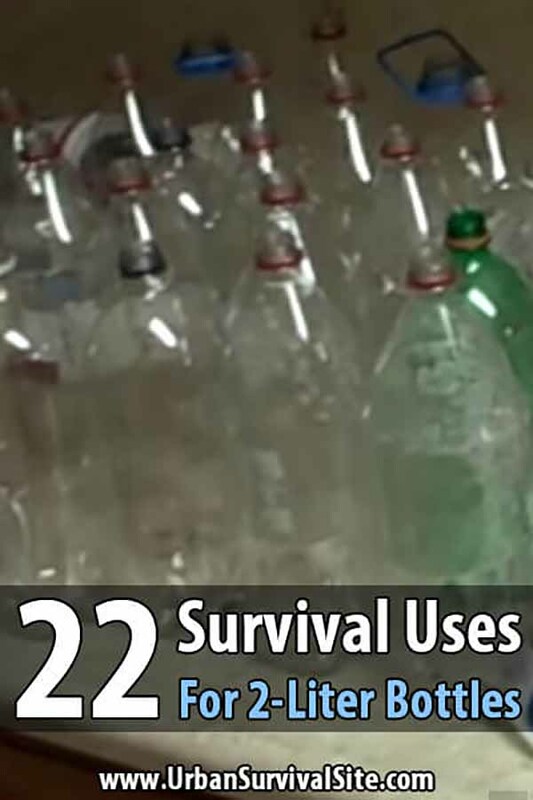 Cut off the top of a 2 liter bottle, turn it over and place it in the bottom, then poke some holes and tie them together with some string. Place the trap in a stream, and minnows will swim inside and not be able to find their way back out. To see what I mean, check out this video. If you need to cross a river or something don’t think you can swim that far, put a bunch of sealed bottles into a bag or tie them all together and use it as a flotation device. If you have plenty of bottles and you’re feeling ambitious, you could even build a small raft like this guy did. You’ll probably never have to do this, but if you’re stuck outdoors with no shoes you can make a pair of sandals using two bottles, some cordage, and duct tape. Here’s how (the astroturf is optional). Having a clean floor isn’t really a matter of survival, but this is too creative not to mention. Basically, you cut the bottom half of the bottle to shreds and attach it to a long stick. There’s a little more to it, though. I haven’t tried this one myself, but it looks like it would work well enough. If water is in short supply but you need to rinse off your hands or something else, you can use a 2-liter full of water as a faucet. Just hang the bottle upside down over a sink or bowl, then slowly unscrew the cap until a thin stream of water pours out. Tighten the cap again when you’re done. Bonus tip: Paint the bottle black and hang it in direct sunlight so you can have warm water. Fill a bottle with water and a few drops of bleach (to prevent algae growth) and stick it in a hole in the roof of your shelter. Sunlight will hit the top of the bottle, and the water will disperse the light throughout your shelter. It works surprisingly well (as good as a 40 watt bulb). In fact, there’s a movement aimed at bringing this idea to communities without electricity.